Dr. Gravielle earned her bachelor degree in Biology from Universidad de Buenos Aires in 1985. She subsequently earned her doctoral degree in Biology from Universidad de Buenos Aires in 1992 where she was a fellow from the Consejo Nacional de Investigaciones Científicas y Técnicas (CONICET-Argentina). Simultaneously, she was a teaching assistant in Histology in the Facultad de Medicina, Universidad de Buenos Aires. 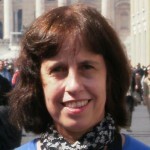 In 1996 she was appointed as Assistant Researcher from the Consejo Nacional de Investigaciones Científicas y Técnicas in the Instituto de Biología Celular, Facultad de Medicina, Universidad de Buenos Aires. Later, she performed a postdoctoral training in the Department of Pharmacology and Experimental Therapeutics, Boston University School of Medicine under the mentorship of Dr. David Farb (1998-2000 and 2002-2005). In 2005 she joined the Instituto de Investigaciones Farmacológicas (ININFA) where she works as an Independent Researcher from the Consejo Nacional de Investigaciones Científicas y Técnicas. She currently works at the LABORATORY OF CELLULAR NEUROBIOLOGY.